Edamame or edamame beans is a popular Asian food which has caught on in other parts of the world as well. It is made from soybeans which are harvested before they start to harden, and then quickly parboiled and frozen to retain their fresh flavor. There are a number of ways to eat edamame, ranging from plain out of hand snacks to processed in sweets and savories. Many Asian grocers stock edamame, as do large grocers in many areas, along with health food stores. Soybeans have been cultivated as a source of food for thousands of years. There are a wide range of ways to use soybeans, ranging from the fermented and aged soybeans in soy sauce to the milked soybeans used to produce soymilk, a popular dairy alternative. Many people eat soy products because the beans are believed to be beneficial to human health, since they carry lots of protein, calcium, and vitamin C. In many cases, soy products are also high in fiber, especially when whole beans are eaten as is the case with edamame. Typically, soybeans are allowed to mature on the vine to form hard beans which can be easily harvested and stored. However, they can also be picked at the peak of ripeness, right before they start to harden, and these soybeans are called edamame in Japan or mao dou in China. The beans are tender, soft, high in nutritional value, and they have a delicate flavor which some consumers find quite enjoyable. As a general rule, a field of soybeans will be used to produce either shell beans or edamame, but not both. One of the most traditional ways to eat edamame is in a lightly steamed or boiled form, whole in the pod. The beans may be shelled and added to salads, sandwiches, and soups as well. The cooked edamame can be eaten hot or cold, and some consumers pack it into lunches as an easily consumed snack food. The fresh soybeans may also be seasoned with salt, soy sauce, and other ingredients. In Japan especially, edamame is also used to make desserts. Many Japanese desserts use savory vegetables which may be sweetened or spiced, depending on what the dessert is. Edamame makes a rich and intriguing textural filling for rice cakes and similar dessert foods, and it may be dyed or blended with other ingredients. In addition to being interesting to eat, desserts with edamame are also nutritious and very light in flavor. Edamame is a rich source of carbohydrates, proteins, dietary fiber, omega fatty acids and several vitamins and minerals. About 155 gm of prepared edamame contains approximately 16 gm of carbohydrate, 17 gm proteins, 8 gm fats and 8 gm dietary fiber. The same quantity of edamame also contains around 9.5 mg of vitamin C, 41.4 mcg of vitamin K, 0.3 mg thiamine (vitamin B1), 0.2 mg riboflavin (vitamin B2), 1.4 mg niacin (vitamin B3), 0.6 mg pantothenic acid (vitamin B5), 97.6 mg of calcium, 3.5 mg iron, 99.2 mg magnesium, 676 mg potassium, 262 mg phosphorus, 2.1 mg zinc and 1.6 mg manganese. Apart from these, 155 mg of edamame contains about 560 mg of omega-3 essential fatty acids and 2781 mg of omega-6 fatty acids. We all know that soybeans is one among the most nutritious foods. It is the most widely grown and used legumes in the world. Soybeans are rich in protein, carbohydrates, dietary fiber, omega fatty acids and other nutrients. 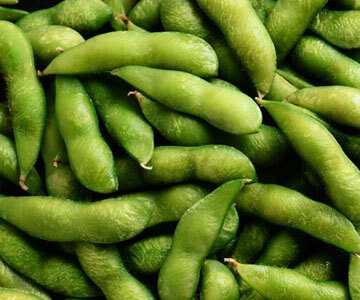 As compared to other soy products, edamame contains more protein, sucrose and abscisic acid (a plant hormone). 100 grams of frozen (prepared) edamame amounts to around 122 calories and contains 11 grams protein, 10 grams carbohydrates, 5 grams each of dietary fiber and fat and 2 grams sugar. The following table deals with the details of edamame nutrition facts. The table provides the nutrient content in 100 grams of frozen and prepared edamame. Now, you know more about edamame nutritional value. The following paragraphs deal with the health benefits of edamame. Edamame is an excellent, and popular, snack especially among athletes. The reason being its high protein content. Edamame including dry roasted edamame is quite popular as a snack and is specially beneficial for the vegetarians. This is because, it is one of the few plant foods, which contain all the essential amino acids. So, edamame is considered as a source of complete proteins. In addition to protein, edamame is a rich source of many other nutrients, and so, have a number of health benefits. Edamame is used for high cholesterol, high blood pressure, and preventing diseases of the heart and blood vessels. It is also used for type 2 diabetes, asthma, lung cancer, endometrial cancer, prostate cancer, and thyroid cancer, as well as preventing weak bones (osteoporosis), and slowing the progression of kidney disease. Other uses include treating constipation and diarrhea, as well as decreasing protein in the urine of people with kidney disease, improving memory, and treating muscle soreness caused by exercise. Women use soy for breast pain, preventing breast cancer, preventing hot flashes after breast cancer, menopausal symptoms, and premenstrual syndrome (PMS). Below here are some of the most important edamame and dry roasted edamame health benefits. Edamame contains significant amount of dietary fiber, which helps to lower the level of cholesterol in the body. This too, can prove beneficial for the health of the cardiovascular system and the heart. Isoflavones found in soy products and edamame have also been observed to lower the level of cholesterol. Edamame contains calcium which is important for the growth of strong, healthy bones and teeth. Edamame also helps to maintain bone density. Soy protein and fiber helps to control hunger by giving a sensation of fullness. High cholesterol. Eating soy protein in place of other dietary protein seems to slightly reduce total cholesterol and "bad cholesterol" (low-density lipoprotein (LDL) cholesterol levels). Hot flashes caused by menopause. Eating soy protein seems to help hot flashes caused by menopause, but it doesn't seem to help hot flashes in women with breast cancer. Reducing the risk of osteoporosis (weak bones), especially in women who have passed menopause. Most evidence suggests that soy protein can increase bone mineral density (BMD), or slow BMD loss in women near or beyond menopause. Soy does not seem to help BMD in younger women. Reducing the risk of developing breast cancer. Researchers think early exposure to soy may be key. Asian women who eat a traditional diet high in soy seem to be less likely to develop breast cancer. This benefit continues even when Asian women move to western cultures where soy is less likely to be a regular part of the diet. This suggests that exposure to soy early in life (i.e., before menopause) provides the most protection against breast cancer. However caution is to be taken with soy for treating breast cancer, see "Special Precautions & Warnings" section. Reducing the duration of diarrhea in infants. Preventing and treating diabetic nerve problems. Providing nutrition to infants who can't digest milk sugars. Reducing protein in the urine of people with kidney disease. Treating infants who have trouble digesting lactose (galactosemia, hereditary lactose deficiency, lactose intolerance). These are some of the main edamame health benefits. Edamame is a healthy and delicious food that can be enjoyed in various ways. For example, edamame can be boiled, steamed, roasted or added to soups. You can also add steamed edamame to vegetable salads, or just serve it with spicy sauces. To sum up, you can incorporate this food in several ways in your diet to derive its numerous health benefits. For preventing weak bones (osteoporosis): 40 grams per day soy protein containing 2-2.25 mg isoflavones per gram. 20-60 grams per day of soy protein providing 34-76 mg isoflavones. concentrated soy isoflavone extracts providing 50-120 mg/day of isoflavones. For diarrhea in infants, soy fiber fortified formula containing 18-20 grams of soy protein per liter. For type 2 diabetes, touchi extract 300 mg three times daily. Touchi is a traditional Chinese food prepared from soybeans. For type 2 diabetes in postmenopausal women, 30 grams of soy protein daily, containing 132 mg of phytoestrogens daily for up to 12 weeks. Consuming soy foods such as soy protein is LIKELY SAFE. Taking soy dietary supplements also seems to be safe for most people when used short-term (up to six months). Soy can cause some mild side effects such as constipation, bloating, and nausea. It can also cause allergic reactions involving rash and itching in some people. Long-term use of high doses of soy dietary supplements is POSSIBLY UNSAFE. There is concern that taking high doses might cause abnormal tissue growth in the uterus. Over the years, as the popularity of soy has held fort for the above mentioned benefits, researchers have also discovered several ill effects of soy which offset the gains. Excessive consumption of soy apparently seems to contribute too much estrogen into our bodies. So, eating too much soy might make men a bit more 'in touch with their feminine side'. Other things associated with soy milk is that the estrogen level spike in the male body leads to growth of breasts in men. Other more disturbing researches show that over-consumption of soy in infant and children may lead to more than just effeminacy. Researchers claim that too much estrogen in men might make them think and act like women and slowly make them infertile. So it seems like over-consumption of soy is terrible for men on account of the estrogen levels. But it must be terrific for women right? Wrong. Like a rationed and rational consumption of soy helps avoid cancer, over-consumption can lead to stimulation of growth of cancerous cells in females. So, is soy good for you? To conclude, I would just like the state the importance of the word 'over-consumption' here. You've probably heard that bit about, too much of a good thing. So while soy stands to bequeath its range of benefits to its more level headed consumer, it can also harm someone who abuses it. So while soy in moderation can be beneficial to your health, too much of it may cause a few health problems. Pregnancy and breast-feeding: Soy protein is LIKELY SAFE in pregnancy and during breast-feeding when consumed in amounts normally found in food. Higher doses during pregnancy might harm development of the baby. Not enough is known about the safety of higher doses during breast-feeding. Stay on the safe side and avoid larger doses. Breast cancer: The effects of soy in people with breast cancer are unclear. Some research finds that soy might "feed" certain breast cancers because it can act like estrogen. Other studies have found that soy seems to protect against breast cancer. The difference in effects might have something to do with the amount taken. Because there isn't enough reliable information about the effects of soy in women with breast cancer, a history of breast cancer, or a family history of breast cancer, it's best to avoid using soy until more is known. Endometrial cancer: Long-term use of concentrated soy isoflavone tablets might increase the occurrence of precancerous changes in the tissue lining the uterus. Don't take concentrated soy isoflavone supplements if you have endometrial cancer. Kidney disease: There is some concern that soy products might increase the risk of kidney stones because they contain large amounts of a group of chemicals called oxalates. Oxalates are the main ingredient in kidney stones. Another concern is that people with serious kidney disease aren't able to process some of the chemicals in soy. This could lead to dangerously high levels of these chemicals. If you have kidney disease or a history of kidney stones, avoid taking large amounts of soy.